The 25.5 cu. ft. capacity of this refrigerator provides lots of space for your favourite foods, while the 3-door French door design makes it easy to store larger items (and lets you open just one door at a time). The stainless steel finish adds a modern touch to any kitchen. Bringing innovation and distinctive design together. LG's new refrigerator with InstaView Door-in-Door will enhance even the most beautifully crafted kitchen. The sleek tinted glass panel illuminates with two quick knocks, allowing you to see inside the easy access compartment without ever opening the door, reducing cold air loss to help keep food fresher longer. The Magic Chef 4.3 cu. ft. Top Mount Mini Refrigerator offers all of the storage options you could hope for and then some. An ENERGY STAR certified unit, special features include a convenient beverage dispenser that keeps pop cans in the door, extra door shelves for frequently used items and easy-to-clean glass refrigerator shelves. 33-inch 25.5 cu. ft. French Door Refrigerator with Ice Dispenser in Stainless Steel - ENERGY STAR® The 25.5 cu. ft. capacity of this refrigerator provides lots of space for your favourite foods, while the 3-door French door design makes it easy to store larger items (and lets you open just one door at a time). The stainless steel finish adds a modern touch to any kitchen. 33-inch 25.5 cu. 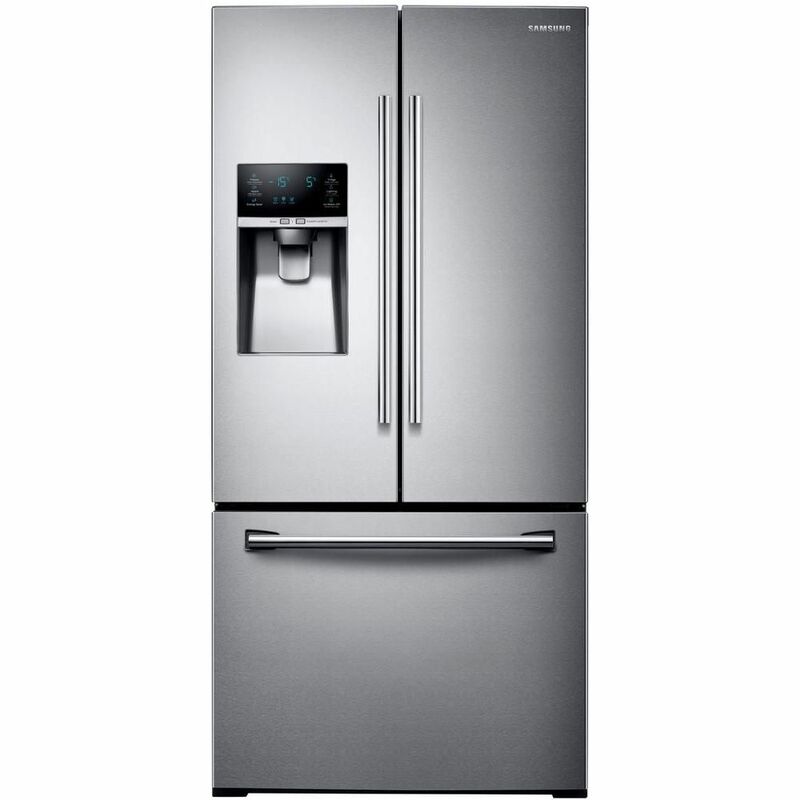 ft. French Door Refrigerator with Ice Dispenser in Stainless Steel - ENERGY STAR® is rated 4.0 out of 5 by 239. Rated 5 out of 5 by Ang from I love my refrigerator it's great. I love my refrigerator it's great. Rated 4 out of 5 by N8WuzHere from Nice fridge So far so good! Best fridge I've ever owned. We love the filtered water and ice. Here's hoping it will stand the test of time. Rated 5 out of 5 by Donna from I am very pleased with my new fridge. The... I am very pleased with my new fridge. The only small problem I have discovered is that it is tooheavy for me to move by myself. My old GE side by side was much lighter. I will just have to waituntil I have someone else to help. I glass slipped from my hand when I was getting some water and some of the broken glass went under the fridge. Rated 4 out of 5 by FloridaNonna from I like everything about this refrigerator. It was the right size for the spot we wanted. Like all... I like everything about this refrigerator. It was the right size for the spot we wanted. Like all the features: alarm, freezer on the bottom, lots of space for our needs (just the 2 of us most of the time, company every once in a while). Giving it a 4 star because we have well water and have not hooked up the ice machine yet, so can't judge on all it's features. Thinking about buying it for our main home, this one is at our farm house. Rated 2 out of 5 by TimB from I have had problem with the refrigerator since It was... I have had problem with the refrigerator since It was delivered on 1/3/19. The water dispenser drips continuously. Samsung has been to my house to attempt to fix unsuccessfully. I have another appointment for them to come out agiain on Friday 2/8/19. Rated 1 out of 5 by robertoRM from our ice maker stopped working 4 months after purchase for our new home last year. figured it was ... our ice maker stopped working 4 months after purchase for our new home last year. figured it was a glitch. thawed and restarted it. worked for a few weeks, then froze again. repeated thaw and restart; froze up and stopped working again. called home warranty company to repair; was told all samsung refrigerators in this class (french doors/bottom freezer) are subject to a recall for this and related issues, so no repair would be made. research shows no recall by samsung, but there IS a class action lawsuit because this issue is so widespread, and samsung is stonewalling, having made no effort to correct this issue. web search "samsung refrigerator class action lawsuit". waiting for samsung-contracted service at this very moment, as the unit is still under samsung purchase warranty, after samsung spontaneously cancelled my first service appointment without cause. my advice: avoid this brand refrigerator at all cost... in our case over $2500, so far... as this lemon will give you nothing but agony. my home is full of OTHER samsung products (large screen televisions, sound bars, stove, microwave, etc), but this will cure me of samsung for any future purchases. Does it have protection for finger prints?